This is a great idea for a more sophisticated Easter brunch. Very attractive though. 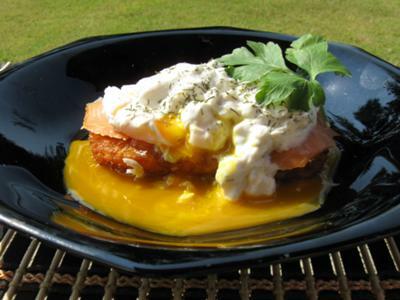 I tried a mixture of soft-boiled eggs, smoked salmon, cream cheese on a hash brown bed as a substitute for a regular slice of bread. Bring about 3 inches of water to a simmer in a wide pan with 1 tablespoon white vinegar. Crack the eggs into small dishes. Slide each egg into the simmering water. Cook until the whites are set and the yolks are cooked to desired. Remove eggs with a slotted spoon, and transfer to a plate; cover and keep warm. Bake the hash browns in the oven according to directions. Place hush browns on serving plates topping each with a slice of smoked salmon. Cover each patty with a mixture of cream cheese, sour cream, and two teaspoon of finely chopped fresh herbs. 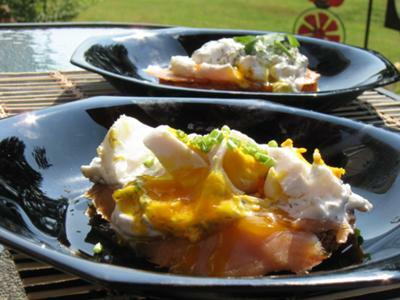 Place poached eggs over it, sprinkle with chives and serve right away. This looks absolutely scrumptious! I can't wait to try this one out. Love it, Anne. This looks amazing!! I am definitely going to try this very very soon.